Incarnation—the idea that God became human and lived among us in the form and spirit of Jesus—what does that look like in 2014? That is what I agreed to write about for this syncroblog post with the MennoNerds blogger group. What does it mean to live as if God is still living among us? It may look like one thing for the women (two) who blog at MamaCongo living as expatriates in Congo, Africa. It may look like another thing with my friends living in Tembisa, South Africa, who I’ve gotten to know through our church’s partnership with St. Peters Uniting Presbyterian Church, some of whom I “see” frequently on Facebook. Local doesn’t feel like just Harrisonburg, Virginia anymore, with the World Wide Web. 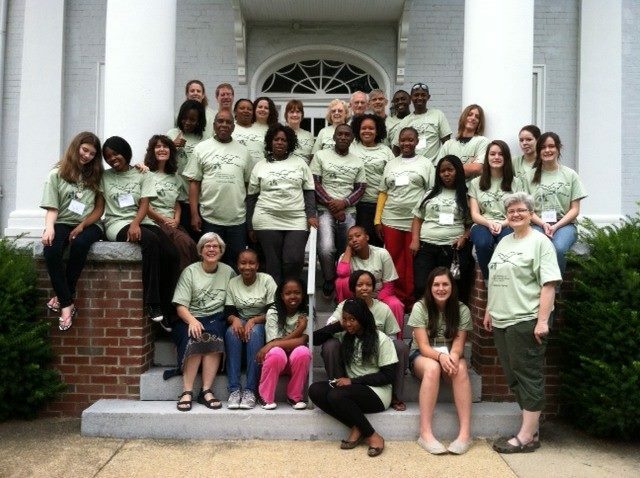 Youth from St. Peters Presbyterian Church in South Africa came to spend three weeks with youth from Trinity in Harrisonburg, Va. The church we have been a part of since 1975 was organized and founded on the principles of Church of the Savior in Washington, D.C. which is nothing if it is not local mission. When I was a student at Eastern Mennonite University, one of our Freshmen required field trips included a stop at this exemplary congregation in the middle of the nation’s capital to see what we could learn. 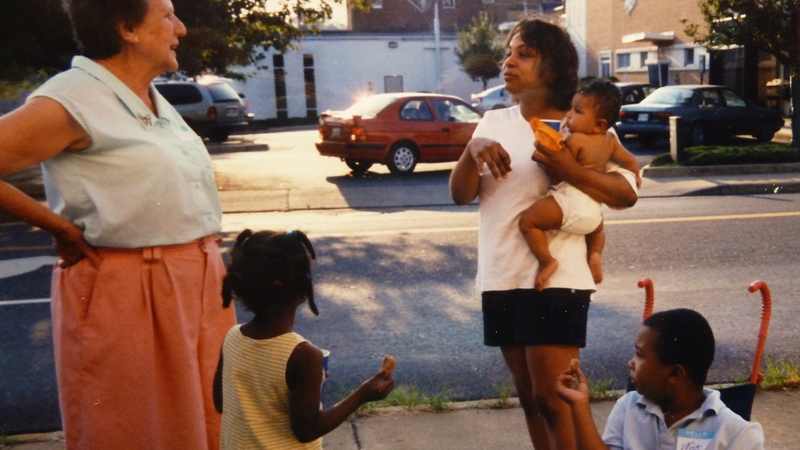 Founded by the late Gordon and Mary Cosby, the church taught that the organizing bedrock of the church and its small groups or covenanting communities (called house churches at my church) is mission: the more local and present tense, the better. Why? Our church has four core values or areas of focus, which we name “marks of the church”: worship, nurture, fellowship and mission. Each house church is to actively practice each of these values, and include mission as one focus. In fact, we “issue a call” around a mission vision. Someone wants to deal with homelessness in the community. Fine, organize around that. Someone sees a need to connect with individuals and families dealing with AIDS in the early 80s when nobody knew much about it. Etc. greeting and talking with the children and babies who came to the Clothes Closet. Through the years house churches have been organized around calls to look at or minister with offenders/inmates, adult day care, youth in trouble, arts/drama outreach, needs of those with intellectual and physical disabilities, international students and families in our midst, refugees, poverty, housing, racial relations, hunger, health issues, loneliness, those with head injuries and permanent disability, environmental issues, a coffeehouse ministry, emergency housing, a mobile homeless shelter, and more. This in a congregation which has never had more 100-150 members, founded in 1963. 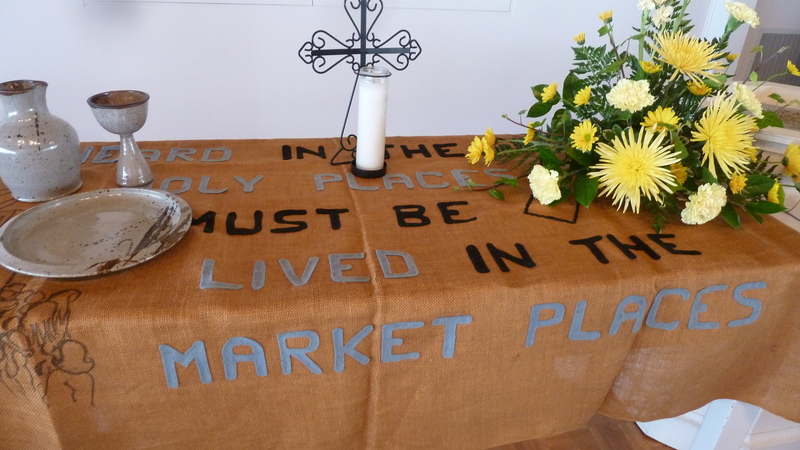 The quote on the banner, which we used at our church’s 50th anniversary last fall, says “That which is heard in the holy places, must be lived in the marketplaces.” The banner represented the long ministry of “The Marketplace Coffee House” in Harrisonburg. The South Africa house church, eventually dubbed African Partnership has been one effort that bridges across continents. While you might wonder how that could be considered “local ministry,” it has been foundational in shaping an awareness that the church is never just local, but international and helps us keep in touch with the bigger fellowship and ministry of Christians around the globe. The fact that it was first called into being by the youth of the church helped too in stretching us to be involved. Being a faithful follower of Jesus in 2014 goes right back to about the year 33 when Jesus asked his followers then, and us now, to “Go into all the world and make disciples.” Sometimes the world is next door or the next town. Sometimes it is 5,000 miles away. The heart of the gospel is living faith wherever we are and responding to the needs we see around us, just like Jesus did. Sometimes we’re that way too—not ready to listen to the words of Jesus about reaching out beyond our own flock. How does your church engage the surrounding community? Is it as outward focused as it is inward? How do you balance? This post is part of a MennoNerds Synchro-Blog on Missionary Spirituality for the month of February. MennoNerds is exploring “spirituality through an Anabaptist-Christian lens” and what it means concerning participation in the mission of God. Find other MennoNerds blogger posts on this theme here.